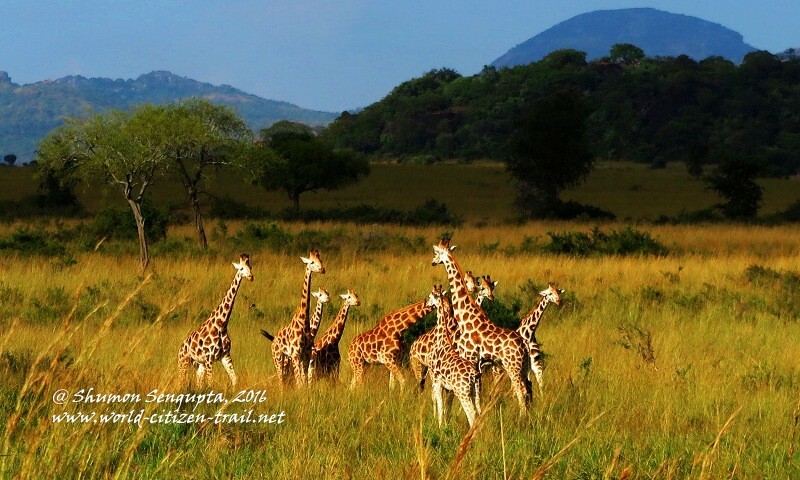 The Kidepo Valley National Park (KVNP) stretches over 1,440 square kilometers in the north-east extreme of Uganda, bordering South Sudan and Kenya. It is characterized by seemingly endless arid and semi-arid rolling plains, intersected by hills, rocky outcrops, ridges and mountain ranges. 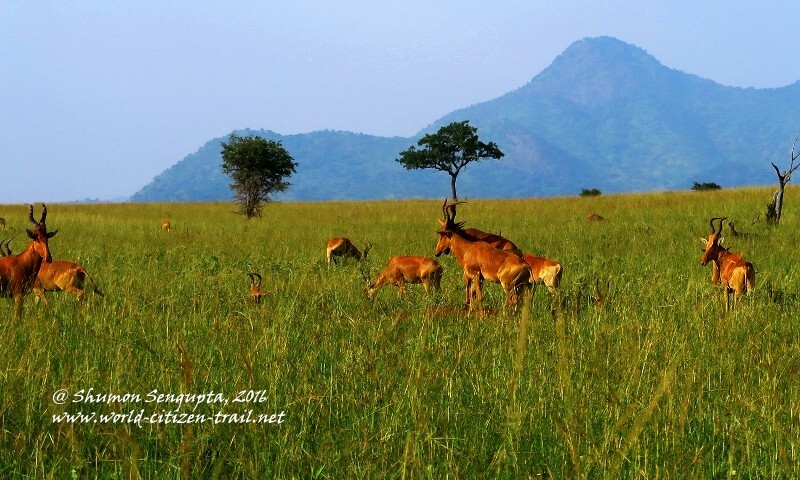 The national park is located beyond the wild frontier region of Karamoja, the land of the legendary and fearsome Karamajong tribes, a close cousin of the Masai tribe in neighboring Kenya. 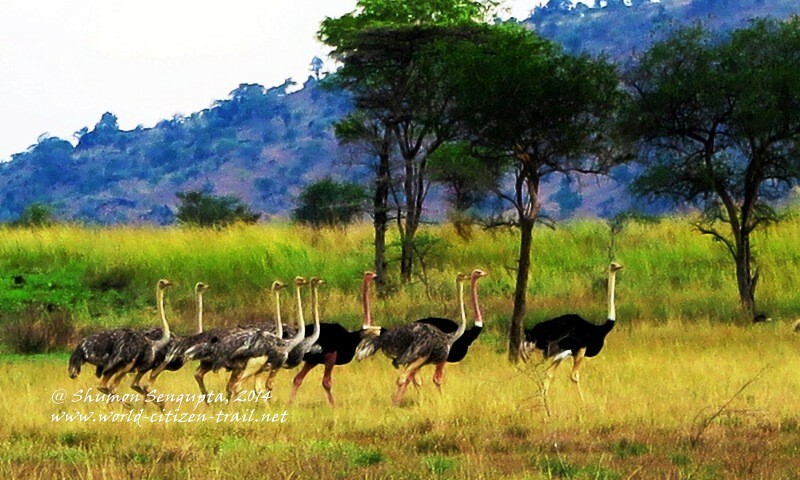 Unlike many busy and touristy national parks of East and Southern Africa, the Kidepo Valley National Park, by the virtue of its remoteness and difficult access, receives very few visitors. 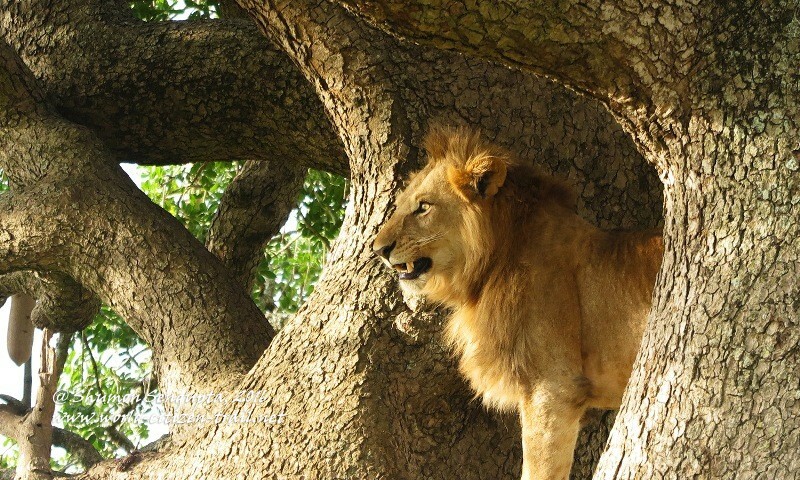 It is one of the few remaining places in Africa that is still pristine, rugged, raw and untouched, without the crowds of visitors that one finds in the popular parks in Kenya and Tanzania. 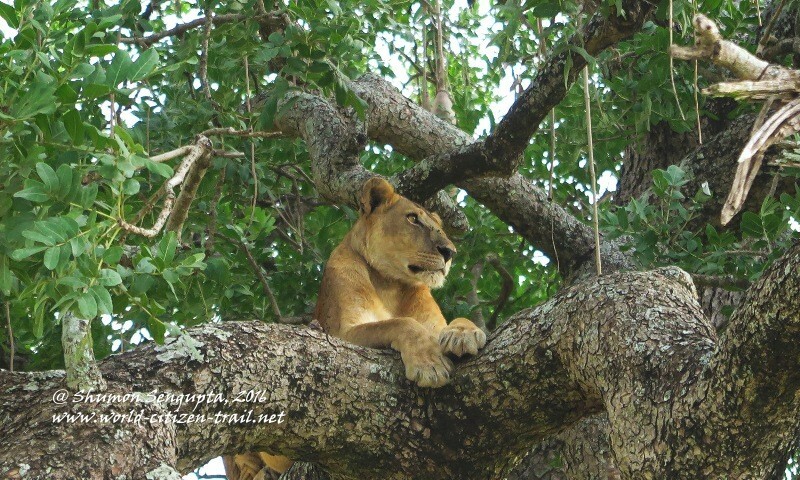 It is Africa’s most remote and least visited area of wilderness and this makes it that much more magnificent, magical and enchanting. I stayed in a lodge (basically a cluster of cottage) in Apoka, deep inside the National Park. Located on the headland above the valley, the lodge overlooks the game-rich Narus valley. 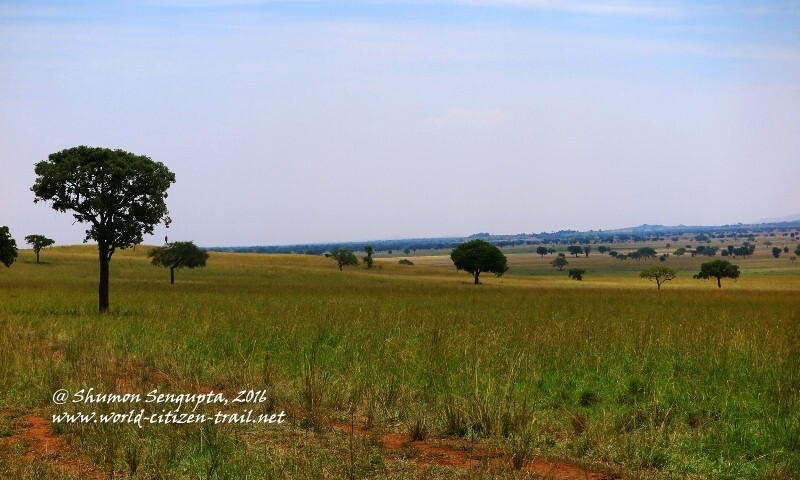 Because it occupies a commanding height over an expansive savannah landscape, it affords views that extend to the distant horizons, fringed by a range of faraway mountains. The place is so immensely vast that you lose your normal sense of space and distance. The stillness is so profound that all you hear is the gentle winds sweeping over the valley, broken from time to time by the distant call of birds and cry of wild animals. 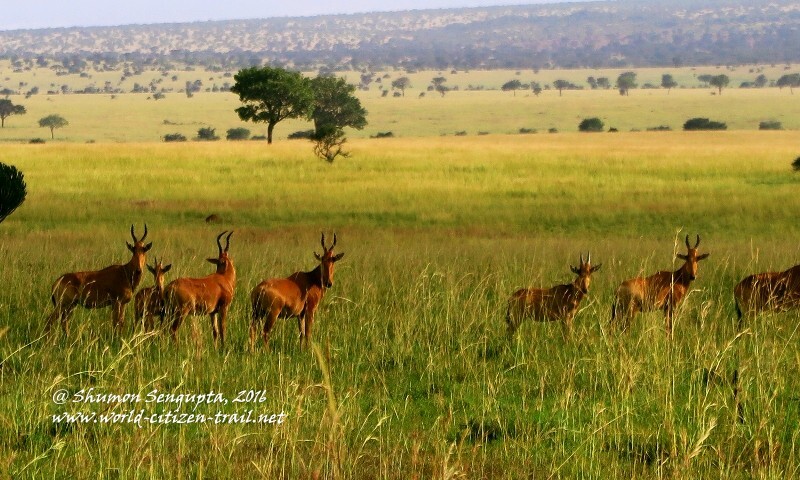 Although the national park takes its name from the Kidepo River, it is made of two major river valley systems – the Kidepo and Narus. The elevation of the valley floors range between 900 and 4,200 meters, with the Narus valley located a higher elevations than the Kidepo valley. 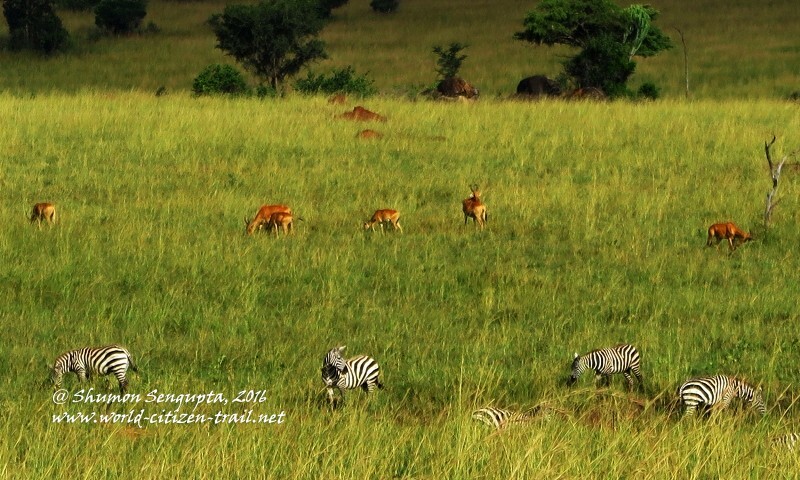 The Narus Valley is located in the south-west of the park and occupies one third of the park. 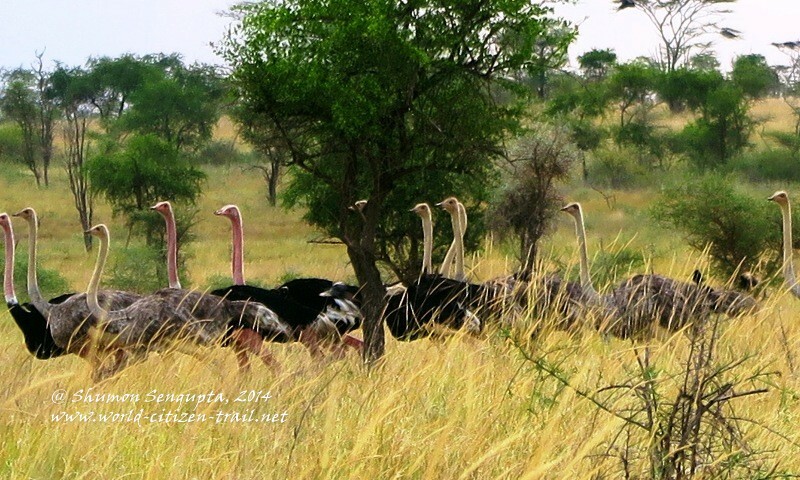 The Kidepo valley occupies rest of the two thirds of the national park, towards its north-east direction. Average annual rainfall is about 800mm, which makes it an arid/semi-arid region. You find flowing water only in the wet / rainy season. 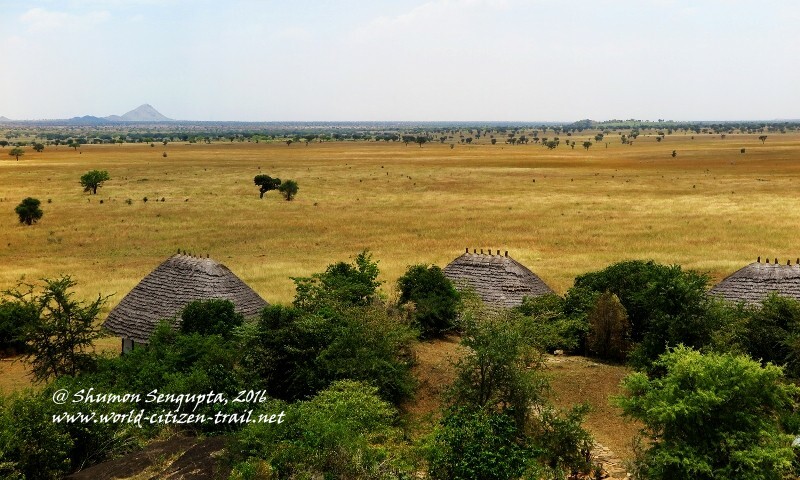 The dry season causes extreme drought, particularly in the Kidepo valley, during which it becomes a vast expanse of parched land. The Narus valley on the other hand has surface and subterranean water – a few permanent water points and wetlands throughout the year. 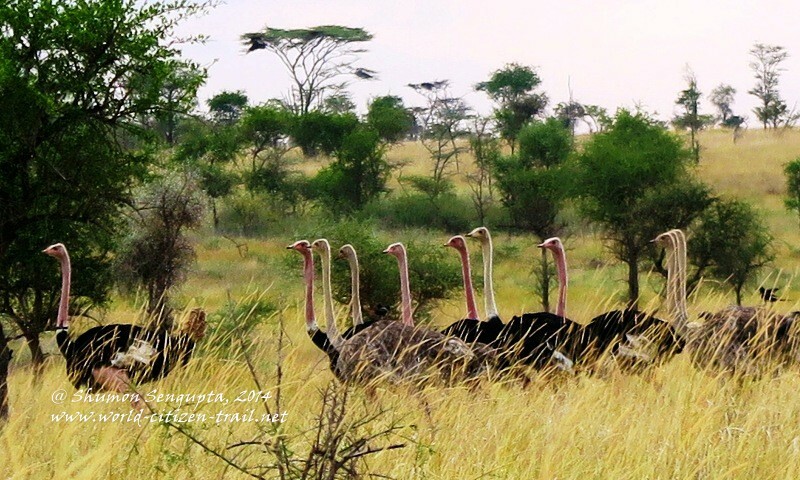 While most of the wildlife in in the greener Narus valley, the main attraction of the much drier, hotter and harsher Kidepo valley are the herds of ostriches, which are not found elsewhere in Uganda. 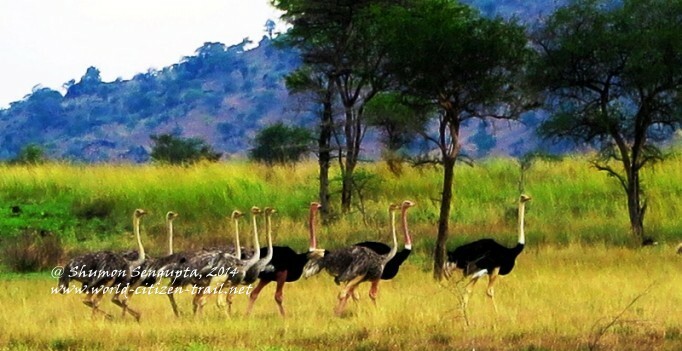 On my second day in the park, from the forest lodge in the Narus valley, I set forth for the Kidepo valley in the early afternoon to check out on the ostriches. 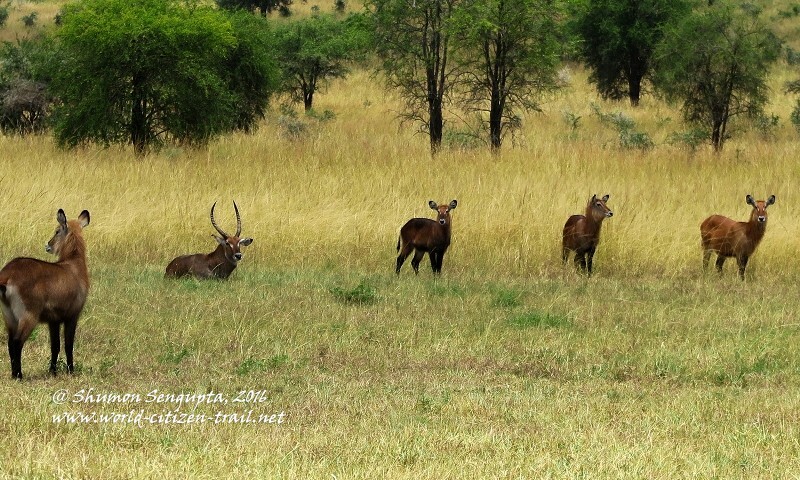 As in the previous game drives, I was in an open safari jeep of the Ugandan Wildlife Authority (UWA), along with a ranger-guide from the UWA. 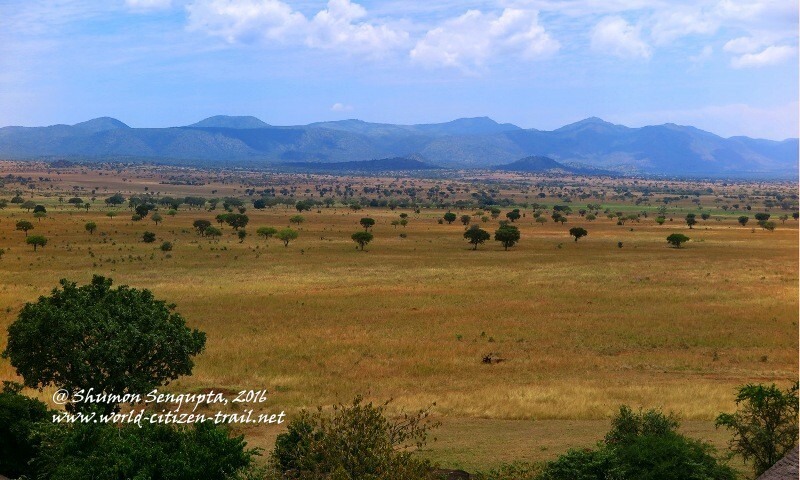 The Kidepo valley is located at a much lower elevation than the Nurus valley and as we descended along the long winding Savanah trail and crossed over to the Kidepo valley, it got warmer and dryer, and the surroundings more rugged and harsh. 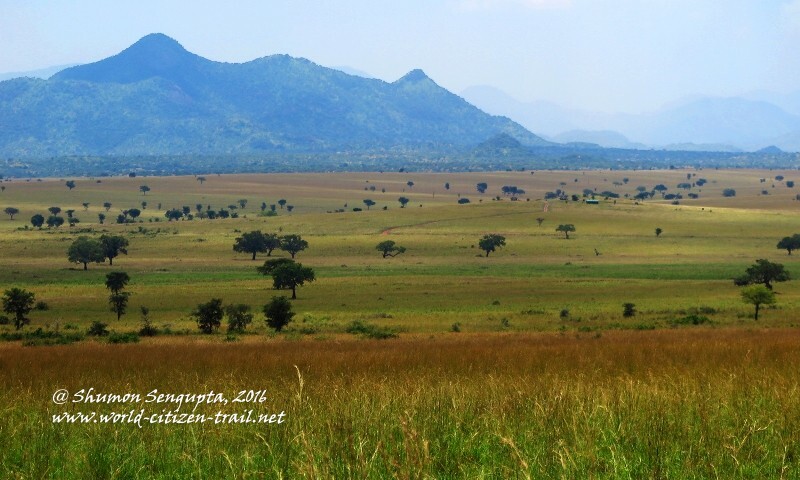 At a distance, in the northern direction, we could see the Lomej and Lotukei mountains near the border to South Sudan. 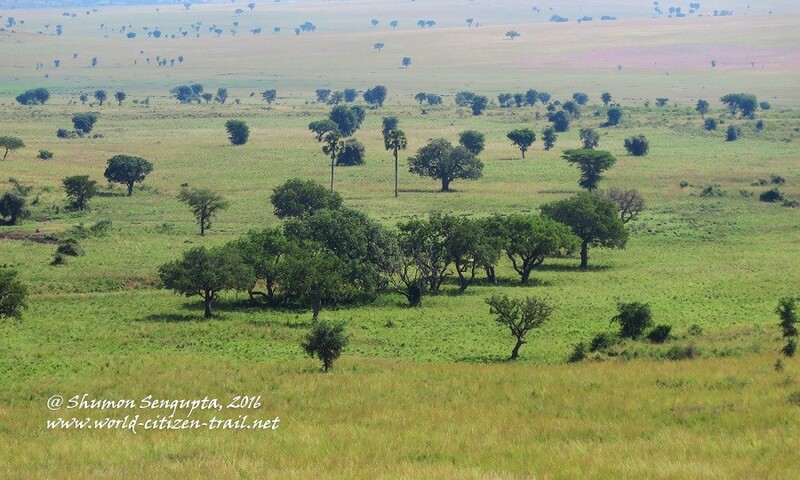 Since our safari jeep was open, we had to endure the vicious stings of tsetse flies, who tend to attack in swarms. 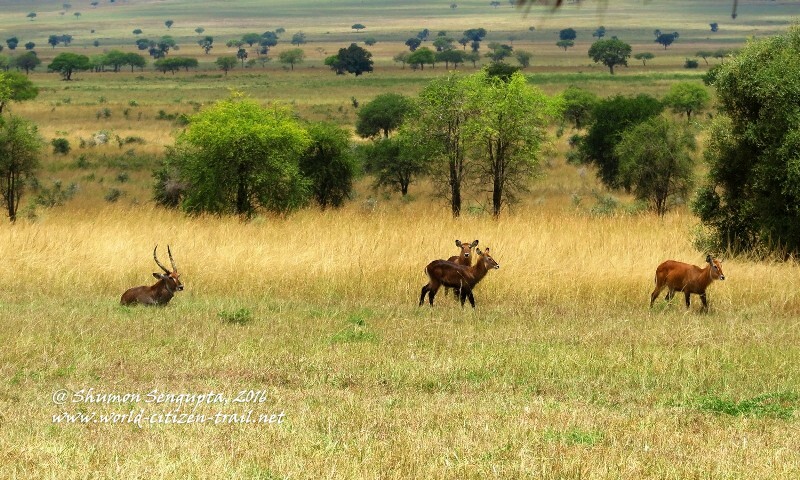 We cut through the vast and spectacular stretches of savannah bordered by distant hills and drove through the dense patches of borassus palms on the banks of the Kidepo River. 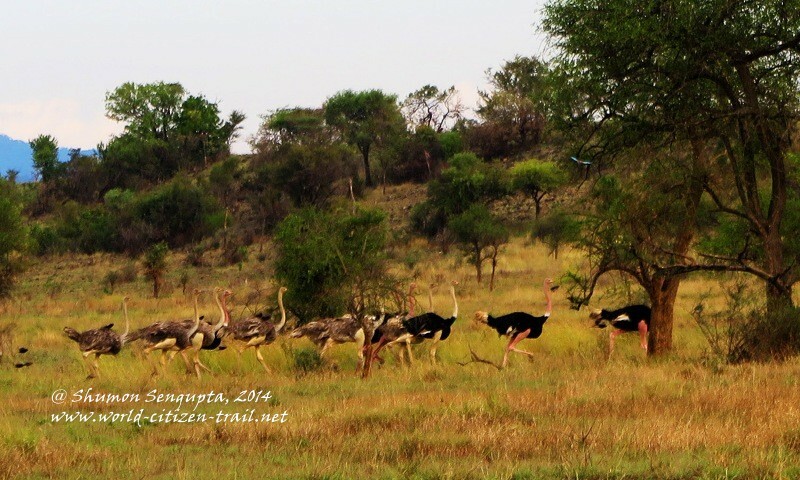 We then crossed over the dry river bed, onto the wide open area – the habitat of the ostriches. 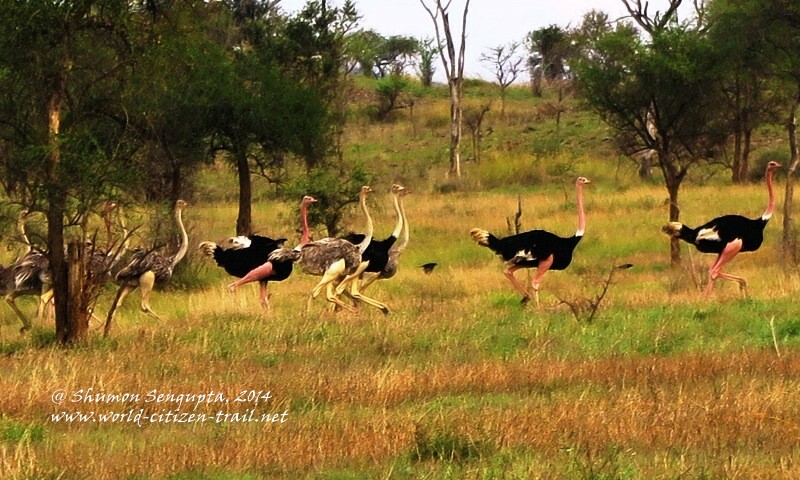 It was almost after two hours, deep inside the park that we finally spotted a flock of ostriches at a distance. From a distance, it looked like a moving blob of pink, black and gray. 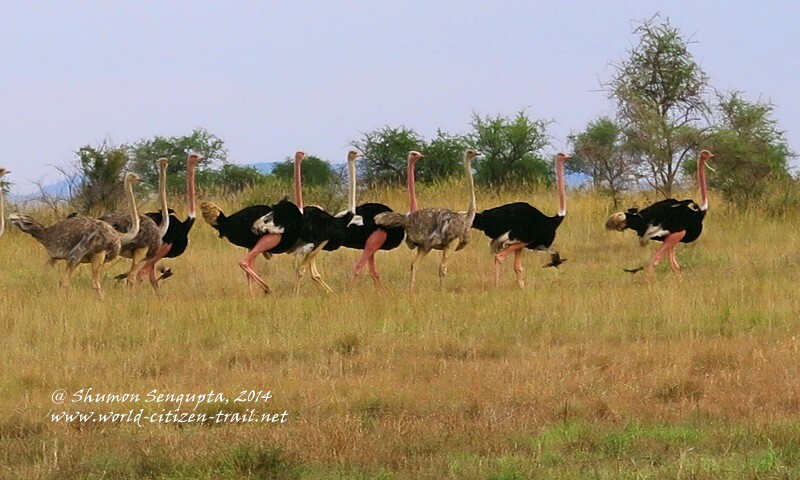 Unlike Lions and Giraffes (that I had photographed at the Kidepo Valley National Park earlier), Ostriches have no interest in humans. In fact, every time we tried to approach them, they simply turned their back on us and ran away as quickly as they could. 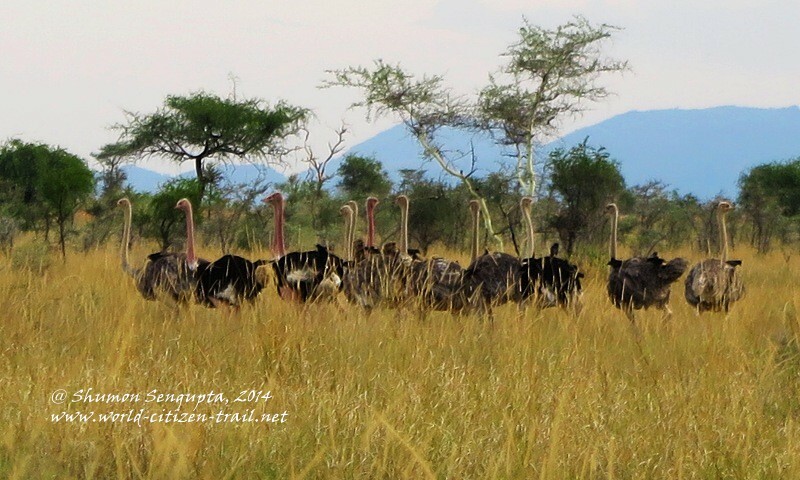 We however did not give up and we followed the herd slowly, deeper and deeper into the arid savannah. At one point in time I suppose they got used to us and slowed down. That enabled us to get fairly close and I grabbed the opportunity to take a few photos. 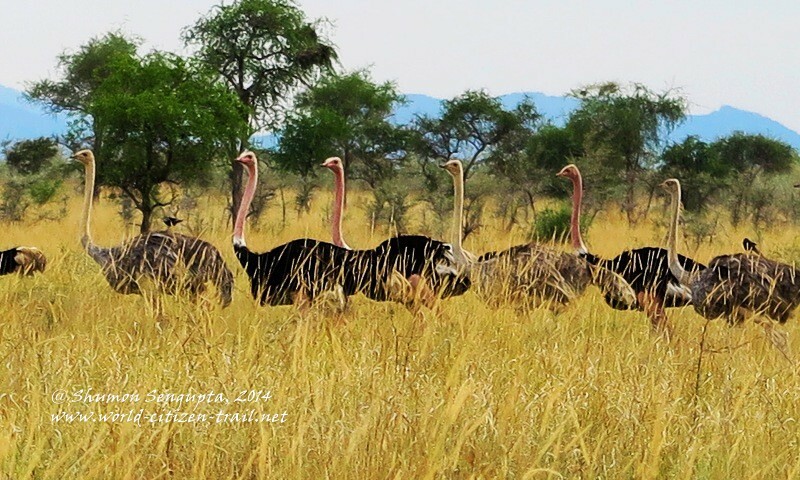 Because Ostriches don’t pause and pose for you, photographing them becomes a challenge – particularly so for an amateur photographer like me. Unless you are a very good wildlife photographer, which I am not, and have fairly sophisticated equipment, which I don’t, you wouldn’t end up with good photographs of these strange terrestrial birds. Since I am a neophyte as far as photography is concerned, these photographs will at best pass off as ‘ordinary’. Nevertheless, I hope, through these photographs I will have partially succeeded in giving you a hint of the fleeting beauty that I beheld, hot on the heels of these unusual and highly mobile creatures. Note: The Black-Pink ones are males, the light gray-yellow ones are females.